Dr. Laurie Luker specializes in Chiropractic Massage, which integrates chiropractic medicine with the proven benefits of massage. Relieves and prevents muscle spasms, which can pull the spine back into misalignment. Increases range of motion in previously injured joints. 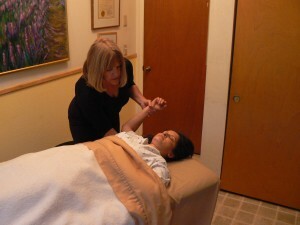 Dr. Laurie Luker graduated in 1986 from Life Chiropractic College-West (East Bay) She has continued her education in classes including, Chiropractic Pediatrics Sports Injury Menopause & PMS Practical Neurophysiology (for health and pain) and Craniosacral Technique. She has been practicing here for 23 years. Dr. Luker also offers myofascial 'Rock' taping as seen in the Olympics.